AFC - 05/20/06 Blind Because of Beauty? Due to their desire for profit, P&G Company patents around 20.000 chemical ingredients per year, so they could launch "new" and "improved" products. 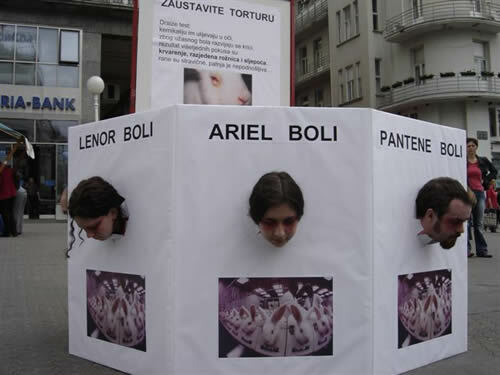 Ariel, Max Factor, Pantene Pro-V, Head & Shoulders, Herbal Essences... are poured into animal's eyes and are applied directly on their shaved skin. Results of these testing are infections, bleedings and blindness, cruel death and 43 billion dollars of bloody profit. Although there are many other alternative methods that have already been tested and released around 8,000 cosmetic products confirming they are harmless for people, P&G continues to perform horrible, old-fashioned and unnecessary testing of cosmetics, cleaning products and animal food. These types of testing are not legally required and hundreds of ethical companies are using more reliable and safer non-animal methods of testing. 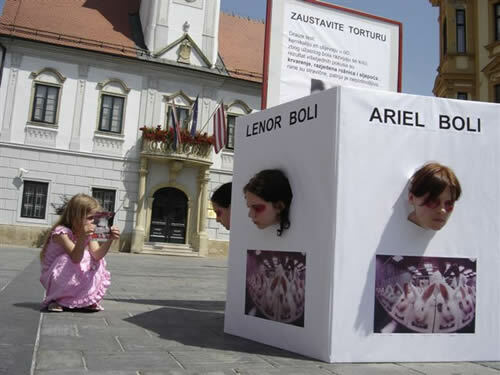 Animal Friends will join around 150 organized protests around the world on Saturday, May 20, 2006; at 11 A.M. on Ban Jelacic Square, on Global Day of Action Against P&G. 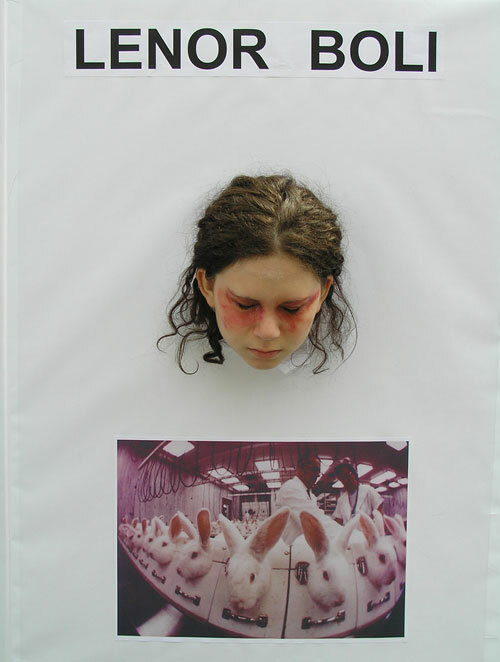 So as to provoke the public to stop ignoring animal suffering, activists will show so called Draize eye irritancy test, where chemicals are poured into the bunnies' eyes, then during a couple of weeks their eyes are monitored for bleeding, destroyed cornea, blindness. No painkillers are given to them to ease the pain. 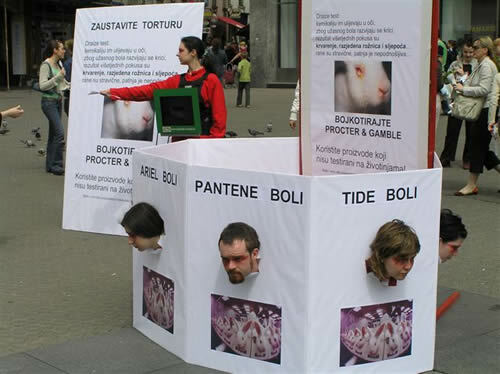 P&G had lobbied the Californian legislative to not ban the shameful Draize test and to remove the ban for animal testing in the EU. Australia, the Netherlands, Germany and Belgium have already banned all testing on animals; Sweden and Denmark banned the sale of any cosmetics that contains the ingredients that were tested on animals. The European Parliament reached the decision that after the year 2009 the majority of cosmetics testing on animals will be banned. Also, the sale of products tested on animals in other countries will be banned in EU. Although P&G is hiding how these types of testing are performed, it has been revealed that they have unnecessarily repeated the skin irritancy test for a certain component in laundry powder. This exact component has already been tested safe on volunteers and is used for many years now. In the tests where animals are forced to breathe in the powder, their lungs were damaged severely and permanently, some animals died before the completion of the test due to the lack of basic treatment, such as providing water. P&G intercedes for massive testing for toxicology and deadly dosage that involve sticking needles into animals' windpipe, forced feeding and rubbing ingredients into shaved skin. Also, P&G is involved into testing genetically manipulated mice to who the ingredients for the liquid laundry powder, skin and hair protection products and the likes are injected into their bodies and noses. This causes severe damage of the lungs, filling with blood and finally ammonia. 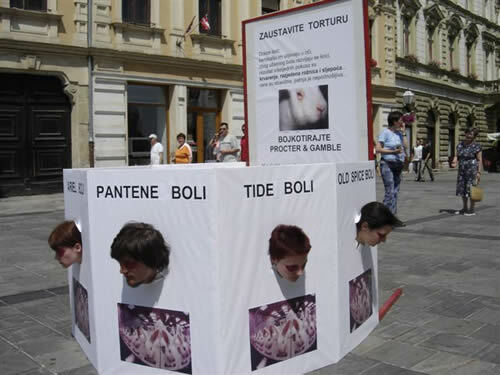 P&G refuses to stop these cruel tests and thus improve the safety of their products. Only in 1996 P&G had spent 5,1 billion dollars on advertising, which is nothing compared to 64 million dollars they claim they spent on developing alternative testing methods! 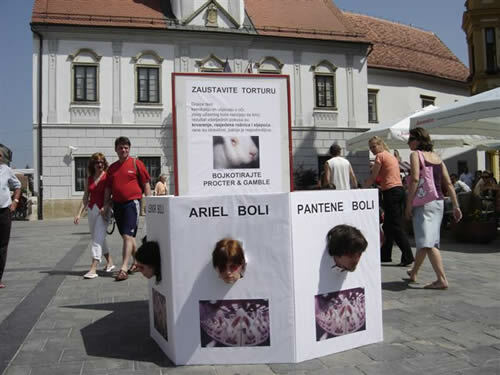 A larger part of the public knows that testing products on animals is totally unjustified. We ask consumers to stop all animal suffering by boycotting companies that continue to kill animals for profit and to support companies that do not test their products on animals.